New to shopping at CVS? Be sure to check out my CVS 101 post that gives you the full scoop on how to get the best bargains at CVS. 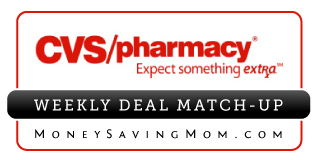 See the full list of deals at CVS here. Looking for more? Read more posts about CVS Deals. « Kmart coupon: $5 off any $5+ purchase!